My carpenter friends, near the end of their projects, have their “punch lists” to serve as reminders what odds and ends still need to be done. I similarly have a punch list for my gardens, a punch list that marks the end of the growing season, a list of what (I hope) will get done before I drop the first seeds in the ground next spring. 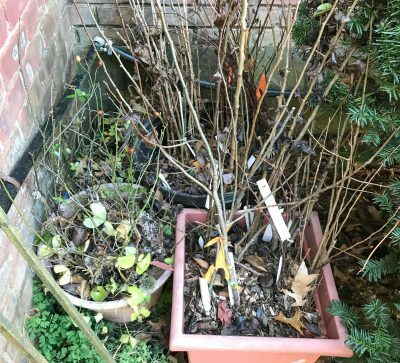 Hardy, potted plants, including some roses, pear trees, and Nanking cherries, can’t have their roots exposed to the full brunt of winter cold. I’ve huddled all these pots together against the north wall of my house but soon have to mound leaves or wood chips up to their rims to provide further cold protection.